Ok, i'd really like to learn how to port mods and templates and I was wondering if anyone would be able to tutor me? I would like to hest port this? could it be, that your title should be like this "Porting Phbb 3 Template To Icy"
Before porting, you should ask the authors the permission to adapt it for Icy Phoenix. And I will answer with DWho his post. If I was you I would start with something very similar to it that can be used with Icy and then make the necessary changes. If you are good with html then it should not be a problem, but if you are not maybe there is something similar that you can use and that you are happy with. Yes. I agree. What would you advive to start with? Use the Custom Icy! function of this board (on the left pannel) and start with the black pearl template as a basis then change a bit the font color to a blue similar to the one of this theme and then change the pictures for those of your theme. 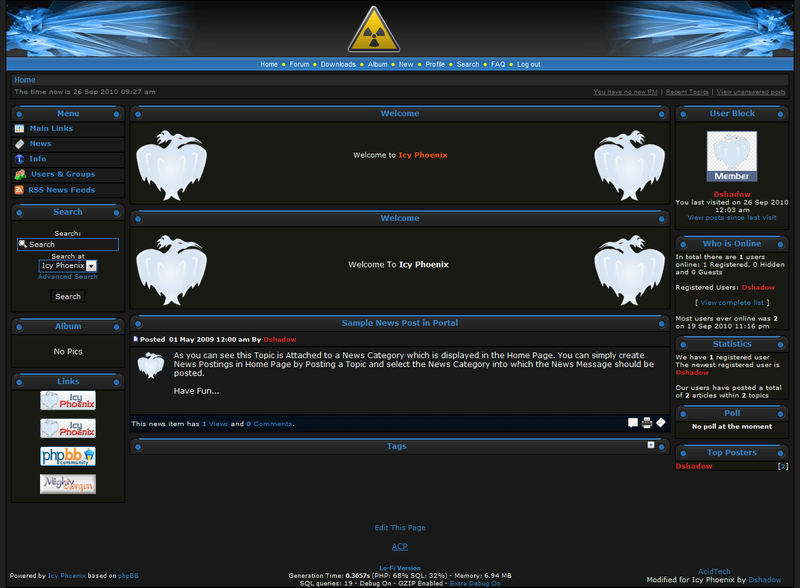 Or there's also the theme " ProsilverIP Black " which is almost similar to this one (for the colors). * Sorry for making another account - It wouldn't let me log in? did you ask the Autor for doing it? In my opinion you should leave this message insite "Designed by STSoftware for PTF. " Great, thank you for your work so far Dshadow64.